Holistic Recruitment: Who Should Swansea City Sign? Transfers are difficult. The ‘Tomkins Law’ suggests under half of them ‘succeed’ while, even if you opened up your definition of success, you’re still likely to identify widespread inefficiency. Being even slightly better at them than your opposition has the potential for huge gains in a competition like the Premier League, or any other for that matter. Data plays a big part in scouting. At an ideal football club, this would be in tandem with traditional scouting, where trained scouts attend matches, watch clips of players and so on to identify strengths, weaknesses and generally profile. Statistical analysis is likely to be used mainly as an initial filter to narrow down a list of potential candidates before further, more ‘traditional’ scouting is done to build a more comprehensive picture. This may seem fairly simple. For example, Swansea need a new striker, so they filter and then scout, right? But filter based on what? Goals? Non-Penalty Goals Per 90? Expected Goals per 90? Age? The filtering process has to be contextualised to maximise the chance that this transfer is a success, and different clubs want different things from their strikers. So we start at the beginning. Why do Swansea need a new striker? Note: 2016 data is a couple of weeks out of date, and all data is provided by Opta apart from ‘values’ which are from transfermarkt. At least a part of the reason Swansea may want a new striker is to do with goals. Bar a brilliant opening 4 games to the season, Bafetimbi Gomis has hardly been inspiring, though this may be at least in part due to the whole team playing poorly. However, Gomis’ responsibilities are not limited to goals alone. Swansea are, traditionally, an indirect, possession styled team that require a fairly competent passer and someone who can hold up play. 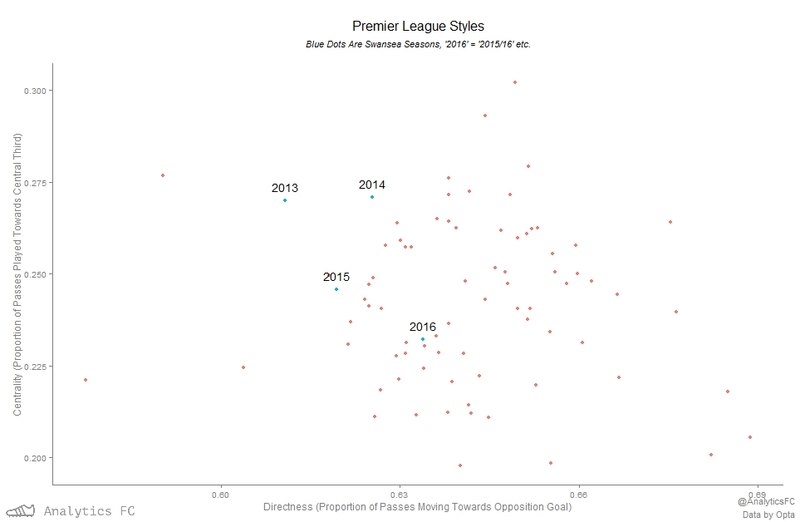 The extent to which Gylfi’s drop in form is systemic, individual or causally tied to Gomis’ introduction is extremely difficult to quantify without insider knowledge of the club – are Swansea playing more down the wing this year specifically to play to Gomis’ strengths, or as an unrelated tactical change? For the sake of this piece (and because it’s my own theory based on watching games), we’ll assume the prior, but ideally coaches could be spoken to and so on. Eder, a £5m signing as back-up to Gomis, has also been uninspiring when rarely played, and has been in and out of the squad with injury. So, now that we know why Swansea may want to invest in a new striker (poor goal output, suffering Gylfi, lack of replacements), we can begin filtering. These metrics aren’t exempt from systemic biases, nor is it ideal to compare output across leagues, but it is somewhat unavoidable and filtering has to be seen as the best attempt to minimise the chances of failure rather than a completely perfect methodology. The players are grouped by name and season, and can have met the criteria last season or this one in any of Ligue 1, Serie A, La Liga, the Bundesliga, Eredivisie or the Championship. As you can imagine, a lot of players ‘out of Swansea’s league’ come through the initial filter. Shuffling them out and removing forwards that I know aren’t strikers (e.g. El Ghazi), we’re still left with way too many candidates. Let’s throw the pensioners out the window and introduce a filter for being under 28 years of age. Also, it’s worth removing players like Odion Ighalo who fulfilled criteria before making the step up to the Premier League, guys carrying long term injuries like Assombalonga and Callum Wilson, and players who have recently transferred like Clinton N’Jie. At this point, we have just over 40 players left, which is probably just about within the grasps of the scouting system of a comfortably wealthy Premier League club. This shortlist can be passed on to relevant staff, who work on building comprehensive player profiles, filtering based on specific criteria and so on. Four of the six remaining players come from the Eredivisie, which is a league Swansea will be less wary to buy from than some given Bony’s success. Nijland, too, may be a bargain given the looming end of his contract. Locadia’s 2014/15 season would have made it through to this stage too had the cutoff been 7 nineties, while he also played more than 2000 minutes with ~ .38 XG90 in 2013/14, and, like Belotti, is still only 22. He’s had a pass completion of over 80% each of the last three seasons, and has played over 30 passes per 90 in the last two. The amount he passes per 90 doubled once Luuk De Jong arrived at PSV, along with a 50% rise in the amount of passes he played from that ‘ten zone’ in the 2014/15 season compared to the one before, which may imply he’s had to drop deeper when playing than before De Jong arrived. Also, three of his five goal this season have been headed, which may mean he could work in both a wingplay oriented Swansea and a slow build up one. These are more initial flags than concrete comments on Locadia’s ability, but they are the sort of insights that can be passed onto scouts, who can then check with their own methods, and used to flesh out a profile. From the limited amount I’ve seen of these players, I know that there’s a range of striker styles and suitability within the 6 player sample. Fischer, for instance, is probably more of a left winger, while Forestieri may be more of a second striker than someone suited to holding up play. Though there may not be many games before the transfer window opens, scouts and recruitment staff have access to services like Wyscout with which they could plunder through gameclips to assess these things before it does. Ideally, someone tasked with filtering would like to have loads of scouting time available to delegate and a large shortlist too, to try and alleviate those systemic biases. Say, for example, Michy Batshuayi is explicitly told not to pass into that ‘ten zone’, or Marseille simply don’t use one, this doesn’t necessarily mean he wouldn’t be good at it, yet he doesn’t make it into a final 6 filtered rather crudely because of a hypothesised time constraint. As far as Swansea go, if they do decide to go for a striker in the January transfer window, I’d be surprised if they hadn’t already started scouting most of the larger shortlist, and almost all of those 6.